A gravid female field cricket observed at night on a patio of a residence, Eldoret, Kenya. 14 October 2010. 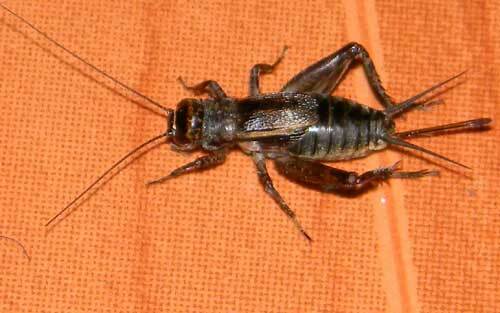 There are species of Gryllus crickets. Most are very similar looking, but with practice an observant naturalist might be able to discern several different kinds by sound. The cricket illustrated here may well be an exotic, accidentally introduced from Europe or Asia by settlers. Field crickets are partial to gardens, lawns and will sometimes enter homes. They feed on especially fallen leaves and dry grass. Crickets, unlike their grasshopper relatives, have long hair-like antennae. This female cricket has at her tail end (at right in photo) a pair of cerci and a long ovipositor. The cerci help detect approaching vibrations and danger. The oviposior is used to lay eggs well below the surface of the soil.